The FORWARD TILTED SEAT (FTS). - Sitting Safely? 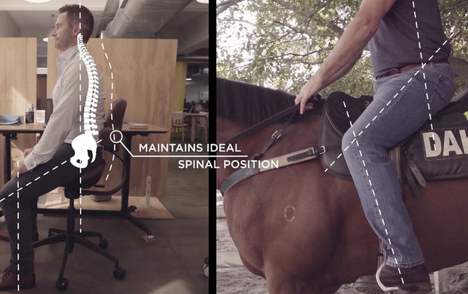 The forward tilted seat concept preserves lumbar spinal lordosis and allows freedom of movement. As already described ☛ Why? Mandal’s Homo sedens workers in Scandinavia, advocated a seat that was tilted forward and down by 20-30° from the horizontal, allowing the hips to extend to 120-130˚ and the pelvis to tilt forward with the lower spinal joints adopting the correct, safe, lordotic posture. No back rest was necessary and the torso was free to move. The unsupported spine may incur slightly greater intra-discal loading probably from muscle co-contraction which is tiring and makes the FTS unpopular. 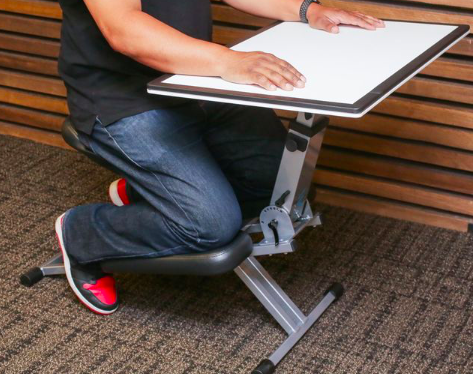 Makhsous (Makhsous M. 2003), has shown that sitting on a horizontal surface involves lumbar flexion relative to standing and has also shown that with seat angled down, weight is largely shifted to the proximal half of the thighs at 18°. This was also shown in previous work (Corlett, 1999, Eklund et al, 1982, Schoberth, 1978). This is relevant for it’s short use in a 3M chair. In a later study, Mandal concluded that the table should be at least half the person’s height (80-90 cm for older pupils) and that the chair should be at least one-third the person’s height (50-60 cm for older pupils). . The tabletop should slope backward 10-15 deg. The seat should be capable of sloping forward 10-15 deg. This entry was posted in Chair REMEDIATION on October 10, 2013 by Dr. Henry Sanford. and all our bipedal ancestors. I think the authors have misunderstood the mechanics of sitting with the rear part of the seat sloped backwards. On trying a similar chair, the DROOP SNOOT, I found that the ischial tuberosities got wedged against the backward sloping part of the seat surface which stops the normal tendency to slide forwards on the seat when the lumbar or pelvic support pushes forwards. This means that the lumbar support can be very effective and if low enough can be pelvic support even though it doesn’t come round the sides of the iliac crest (as in my original concept). Those DROOP SNOOT chairs certainly worked for back sufferers in locating the pelvis but the forces were high which made them uncomfortable for prolonged sitting. They sold in all the back shops about 20 years ago and I visited the manufacturers in High Wycombe. As you say seats like the HM Aaron chair do the same to some extent but not as much as the solid seat of the droop snoot. 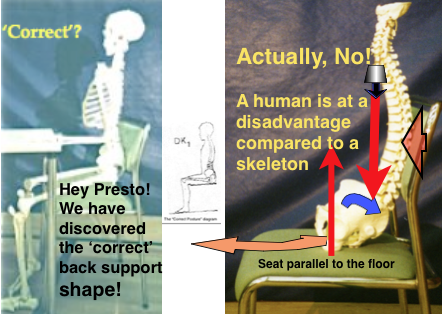 If it fixes the pelvis and therefore eliminates the backward rolling then it will eliminate the bending force in the spine which normally stops the backward rolling which occurs with normal lumbar support. This would reduce intra-discal pressure because part of the pressure is the direct axial weight. The other part is due to the tension in ligaments, such as the supraspinous. ie bending force in the spine will result in compression just as it does in lifting. 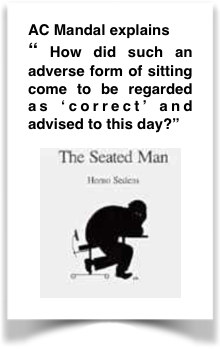 125 Mandal, A.C.: “The Seated Man” (homo sedens). Dafnia Publications, Taarbæk Strandvej 49, Klampenborg, Denmark. 1987.